Great next day service. Very professional and efficient. Excellent Service. Extremely well packaged. Arrived next day. Highly recommended. Quality, price and quick delivery. Easily found what I needed at Taynas online store. Ordered, payed, and it was quickly and efficiently delivered. Excellent value and service. 1st class service. thank you. Fitted perfectly and performing well. An excellent battery that matches the specification set by my bikes manufacturer. Buying from Tayna was effortless, the price was competitive and included a one year warranty together with next working day delivery. Bike wouldn't start, turns over ok, sparks from plugs ok, but no-go! 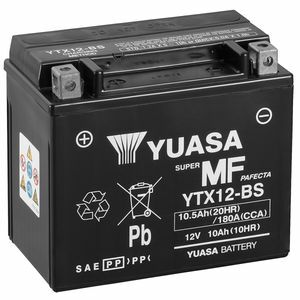 Fitted a brand new Yuasa YTX12-BS and hey presto fired up straight away, problem solved! Just fit a great battery!! Replaces battery like for like on 12 yr old Bonneville which requires a lot of cranking because of flat slide carbs which have no choke. Strong battery. Strongly enough, it does what it says on the box!